Product prices and availability are accurate as of 2019-04-23 22:43:20 UTC and are subject to change. Any price and availability information displayed on http://www.amazon.com/ at the time of purchase will apply to the purchase of this product. Recreate your favorite moments in school history with your Russell Wilson/J.J. Watt minifigure! Goes perfect with the End Zone Quick-Click Set. 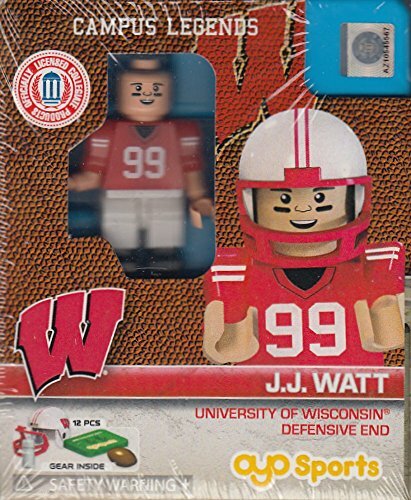 The minifigure looks just like your favorite team player with proprietary bendable knees and poseable arms which allows it to run, pass and tackle! The set comes with Wisconsin Badgers uniform, Wisconsin Badgers helmet, removable face mask, football, water bottle and a custom stand with unique DNA to identify your one of a kind player! Your minifigure looks just like your favorite player! Accessories: 1 uniform, 1 helmet, 1 removable face mask, 1 football, 1 water bottle, and a custom stand with unique DNA to identify your one of a kind player! Proprietary bendable knees and poseable arms which allow them to run, pass and tackle! For ages 6 and up Printed and assembled in the U.S.A.